Ignoring laws that ban child marriages, hundreds of children, some as young as seven years old, were married this week in a centuries-old custom across central and western India. Held to coincide with "Akkha Teej," a summer festival believed to be auspicious for weddings, the marriages took place mostly in small towns and villages, where the laws have little effect and officials could do little more than record the names of the children being married. Hundreds of children were married this week in Rajgarh, about 65 miles northwest of Bhopal, the capital of the central state of Madhya Pradesh. "The law to stop child marriage is not powerful enough," Girija Mewada, a police constable posted at a Hindu temple in Rajgarh, said Wednesday, as she noted down the names of young couples who went to the temple for wedding blessings. India law prohibits marriage for women younger than 18 and men under age 21, and parents who break the law — nearly all such marriages are arranged by parents — can be jailed for up to three months. 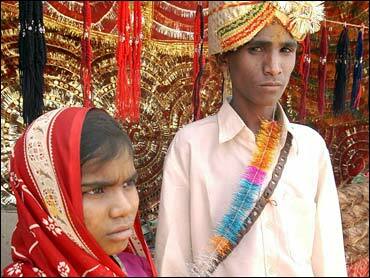 But while the practice is dying out among urban, educated people, child marriages remain common in rural areas. There, it is seen as being beneficial for both families: The bride's parents don't have to support her for very long, and the groom's family gains an unpaid servant, often treated as virtual slave, who usually brings a dowry. The children remain in their parents' houses, though, until the girl reaches puberty, after which she is brought to the groom's home with great ceremony and the marriage is consummated. On Wednesday, 11-year-old Soram Singh peeked shyly from behind her veil a couple of hours after her marriage to Bheeram Singh, 16, a student in the nearby government school. Singh is a common surname in the town, and the two are not related. Dressed in a new blue-colored polyester sari and weighed down with heavy silver jewelry, Soram said she was angry with her parents for marrying her to Bheeram, whom she met for the first time that day. Something of a tomboy, she loves playing tug-of-war and regularly picks fights with boys, whom she believes to be quarrelsome. "I know what happens after marriage," she said angrily. Her new husband, though, was defiant. "I have got married, I haven't committed any crime," Bheeram said. Police and social welfare department officials say they are helpless to prevent such marriages. India's Child Marriage Restraint law passed in 1978 tightened earlier legislation aimed at stopping child marriages, but does not empower police to make arrests without warrants or magistrates' orders. It can also be dangerous to challenge such weddings, which are deeply rooted in many villages' traditions. Earlier this week, a welfare officer underwent 18 hours of surgery to reattach her arms, which were hacked off by an angry father with whom she had argued. She had urged him not to marry off his young daughter to a teenage boy. Political leaders in Madhya Pradesh say a sustained campaign is needed to persuade people to give up their age-old customs. "Nobody should expect the evil of child marriage to be eradicated overnight or just by launching an awareness drive," said Archana Chitnis, state minister for women and child development.